YOUR HOBBY. FULLY EQUIPPED. BUILT FOR LIFE. 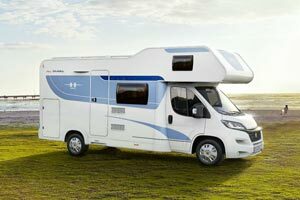 Fully equipped leisure vehicles have been a Hobby trademark for many years. For the 2017 season, Hobby is going the extra mile, also offering its Op ma De Luxe and Siesta De Luxe series mobile homes with full equipment. That obviates the need to purchase expensive op onal equipment or addi onal special equipment packages since Op ma De Luxe and Siesta De Luxe will be factory-equipped fully loaded right from the start. And these complete accessory features are really some- thing special and cover the en re vehicle - from the chassis and body through the interior trim. The exclusive full spec equipment of the mobile home includes high-grade components such as the naviga on system, the hinged roof window in the driver's cab, driver and passenger airbag, GRP roof and GRP floor, XPS thermal insula on, the extra-wide entrance door, the roof canopy, the garage door on the driver's side, the 150-litre super-slim tower refriger- ator developed by Hobby itself, the LED ambience ligh ng, the prac cal pull-out gas canister and not least the innova ve Hobby CI-bus on-board management system with a TFT control panel which facilitates the regula on and control of all devices and func ons of the vehicle network. 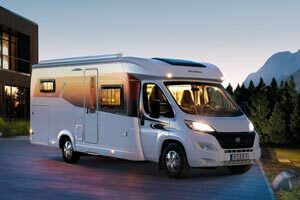 The Vantana represents a completely new class of motorhome. It is compact in the city and flexible on narrow country roads. Driving it is a real joy and living in it is a real pleasure. It's interior design sets new benchmarks in terms of comfort with lots of surprising solutions for an intelligent use of space. 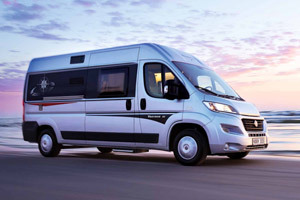 With the new Siesta De Luxe, a motorhome will now come with the all-inclusive equipment for the first time, offering a real price advantage. Expensive details such as the black-out blinds in the driver's cabin, insect protection door, roof awning, insulated and heated waste water tank and many other details are already included in the standard equipment with the De Luxe Package. The Optima is a vehicle for enjoying travelling and living in their most beautiful forms. The interior impresses with its superb quality and perfect and space concept. Highly practical with a range of lovingly thought out details make the Optima unique.